Imagine you’re sitting with your client or patient and things are moving along swimmingly. Suddenly you feel their energy shift. Or perhaps you see their body contract and their eyes glaze. You know you’re at a pivotal juncture, where what you do next determines if they stay stuck in their old paradigms and patterns or they transcend them. You can try to press on. You can try to talk them out of whatever they’re feeling or thinking. However, the more you try to Talk them out of their belief or feeling, the more their resistance takes hold. Now imagine that in the very instant your “spidey senses” tell you there’s been a disruption in the force, you can gently pause and invite them to feel their way through these old beliefs and fears with EFT. One of the coolest things about EFT tapping is that they do all the work. They give you exactly the information you need to help them unravel their own grief, pain and resistance. When you see them hit an emotional wall, you can celebrate that you’ve helped them activate THE core pattern or belief that’s been feeding their issues in the first place! With EFT, we address emotions right where they live – in the body. Using the example of starting a new exercise program, their mental and physical resistance create an emotional response or contraction within their body. If they don’t FEEL like it, the EGO will continue to rational-LIES all the benefits to NOT doing it! 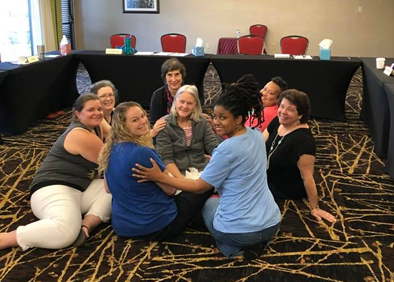 EFT helps them dissolve the resistance, which opens the space for them to anchor the good reasons they DO want to do it and they can become enthusiastic and inspired to exercise. Once they FEEL LIKE exercising, the mind has very little power to sabotage. Just as we know we can’t talk someone out of their phobia by using logic alone (i.e., “thats silly,” “don’t be afraid of spiders,” etc. ), you’re able to help them feel their way through their story. As you Hold the space to listen deeply and allow them to safely feel whatever emotion arises, it will soften and subside automatically. And, undoubtedly, you’ve experienced that Emotions come and go in waves. EFT is a brilliant tool to help you speed up the process of allowing the wave to reach its peak and allowing for the full human experience to be processed. Our natural reaction is to resist the scary wave of emotion because we have some crazy core belief that it’s dangerous and will, therefore, annihilate us. Once you’ve successfully surfed a few of these emotional waves, NONE of them are as scary! As you become more and more skilled at delivering the tools and learn how to reframe the old paradigms with the new higher level perceptions, your client will swiftly and miraculously advance in their awakening to new levels of higher consciousness. Even if they don’t believe in tapping, it can work for them. Debbie had a phobia – fear of snakes. Hear what she had to say about her miraculous healing during an EFT Level 1 and Level 2 training class that she attended for her work! I had the blessing of going to one of Jan’s training classes. My boss, who is an MD, had heard of EFT and believed in EFT and wanted us to be trained. I was skeptical and went because it was a requirement. I went willing to learn to do a trade. What happened was a miracle for me. I had a snake phobia (couldn’t see them in a book on tv or in real life – there just aren’t enough words to describe the fear I had of snakes). My life was changed instantly. I keep saying I am going to send Jan a picture of me HOLDING a snake. I have been in a pet store and now I can stand surrounded by them. I can hold them. You know that the physical world is full of suffering. And you, Beloved, have heard and answered the call to help with universal spiritual awakening. You have unique and precious gifts and talents. You’ve diligently searched, studied, learned and are offering specific tools and techniques that you Love. And the EGO has its own agendas! The coaching counseling or treatment plan you offer them is met with resistance and, if not handled delicately, they can turn against you. The energetic or physical treatment you give them doesn’t hold because their mindset and emotional body isn’t strong enough to maintain the new higher frequency. The present moment gifts you want to offer them are only partially received because their pain body is active. That EGO part wants to dig in and protect its right to “juice” the pain. Because EGO enjoys ruminating over past suffering, it will be subconsciously recycling old patterns. Manifesting more of the same old crap. Have you been yearning (perhaps even praying) for a way to overcome these EGO patterns (in yourself) and/or your client/patients? EFT can help you help them experience greater healing results even faster – with more ease and enjoyment on your part – every single session! EFT gives you the mechanism by which you can calm the fear responses in their body, mind and energy system. Calms the amygdala and moves that stagnant energy. Activates Chi or spiritual energy. Restores energetic/spiritual connection for the personal experience of the spiritual presence and power within. Opens the spiritual ears to hear Divine Guidance. Holistic – addressing mind, body and spirit. Non-invasive – no pills, potions, tinctures or tools needed. Completely Adaptable and Complementary to every belief and healing modality tool or technique. 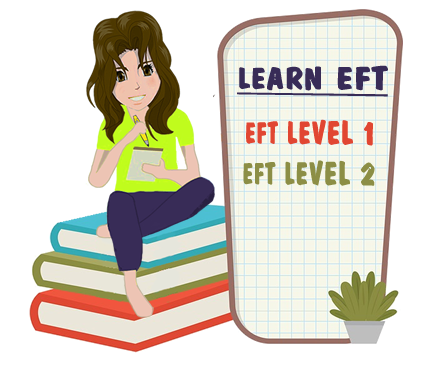 Time for you to learn EFT? Are you feeling open and excited? Are you aware of some resistance? being able to masterfully deliver EFT? allowing this to manifest greater success and income for you and your business? Please know that these fears are normal and to be expected. These are the same fears your clients experience. 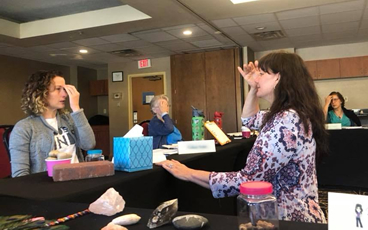 As you read this information, would you be willing to consider that being the profound and wise practitioner, coach or healer that you are, you always want to be in the know about new tools? I think it’s fabulous that your heart’s desire is to be helpful and not cause anyone harm. Of course, you’re going to always be conscientious and careful to not go where you don’t belong. You have faith in your ability to trust the process and just keep tapping. More times than not, this is when you’ll experience miraculous results like I did with Shannon. One particular session changed Shannon’s reality. March 2010, going to OB-GYN for ultrasound – happy to hear it was a girl. But her world shattered as she also received a fatal diagnosis that if the baby lived through delivery – she wouldn’t live much longer. Devastation and the PTSD that followed her. 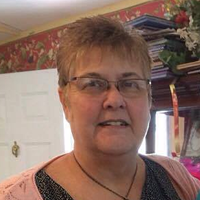 Her session with Jan transformed the diagnosis day into a Celebration day. Being prepared, Shannon did a Build-A-Bear with her daughter’s heartbeat. She had an angel shower / people wrote love notes on her belly. She had a photographer when pregnant and at the hospital (to capture family photos of the 90-minutes that she lived). Now when she thinks of this day, there is deep gratitude. And at the time of this video testimonial, the anniversary of that date brings only JOY. Imagine—having the power to heal your life literally at your fingertips. and negative behavior patterns – often in minutes! The Science and History behind EFT. Why we use meridians and the organs and emotions they represent. Experience a simple experiment that defies logic to see if EFT works for you. Hear Jan’s engaging story of physical and emotional healing and her journey to resiliency after the death of her 22-year old son – all using EFT. PLUS Jan will answer your questions and, as time permits, offer an experiential tapping for something. MASTER the short-form basic tapping recipe. Learn to be Specific, correctly assess distress levels, retesting and following cognitive shifts. Learn about Psychological Reversals; why they occur and how they affect your energy, mind and mood. This one concept provides a NEW and revolutionary understanding of the reasons people don’t heal – and simple techniques to overcome this very common obstacle. 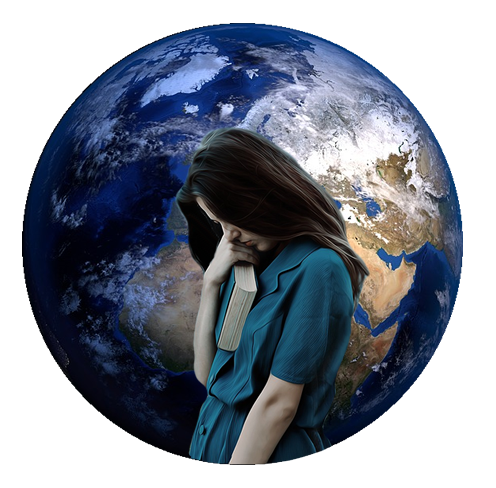 EXPERIENCE powerful EFT techniques – including the Movie Technique for eliminating unwanted memories and the Personal Peace Procedure for healing a lifetime of disappointment, shame, trauma, losses and pain. Practice with Jan’s fill-in-the-blank tapping template so that you always know what to say and when to say it. Learn the fine art of Addressing Physical Pain. The Tearless Trauma technique; sneaking up on the pain, chasing the pain, ways to find core issues, working with physical “dis-ease” and more in-depth testing of results. Jan’s advanced tapping ideas around emotional geysers, your inner critic (what she calls the “EGO”). And so much more. Some of the best teaching comes from students – live and in the moment – during the training. Your tuition includes your full training workbook and replaces our need for PowerPoint slides! There will be lots of laughter and probably some tears. Spirit will deliver insights and personal revelations as well as often unexpected and delightful levels of peace and joy. 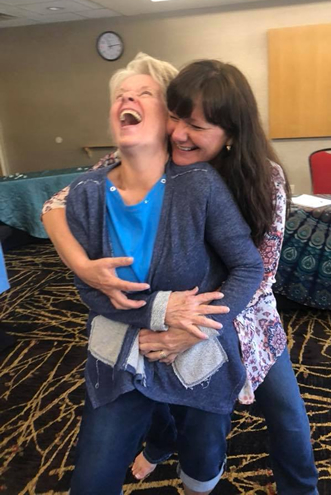 The best part is, when you attend EFT Level 1 and Level 2 training with Jan, you can experience miraculous healings while you learn! Don’t worry! 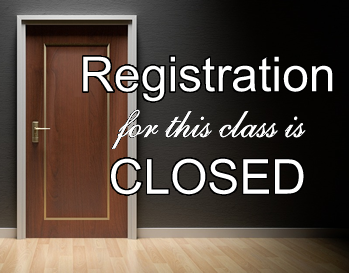 We’ll be scheduling another class once our waiting list fills up again. So get your name on our training waiting list using the form below and you’ll be one of the first to know when our next awesome training weekend is going to happen. IMPORTANT NOTE: Once you click the "Get me on the list!" button below, you'll receive an email asking you to confirm your addition to this mailing list. Please check your email inbox (and possibly your Junk/Spam folder) for this email. You won't be added to this mailing list until you click the Confirm button in that email. Thanks! The EFT Academy, The Grief Recovery Course and The Resiliency Course are trademarks of The Rejuvenation Station, LLC. 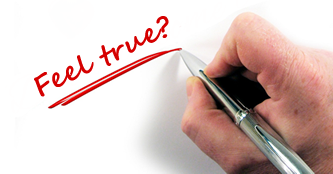 IMPORTANT FINANCIAL DISCLAIMER: The information contained in or made available through this website and our services cannot replace or substitute for the services of trained professionals in any field, including, but not limited to, mental, financial, medical, psychological, sales or legal fields. We do not offer any professional, medical, financial or legal advice and none of the information contained in the website and our programs should be confused as such advice. The information we provide on this website and in our sessions and programs is provided for educational and informational purposes only, without any express or implied warranty of any kind, including warranties of accuracy, completeness, or fitness for any particular purpose. Your use of this information is AT YOUR OWN RISK. YOU SHOULD NOT MAKE ANY FINANCIAL DECISION BASED ON ANY OF THE INFORMATION PRESENTED WITHOUT UNDERTAKING INDEPENDENT DUE DILIGENCE AND CONSULTING A PROFESSIONAL FINANCIAL ADVISOR. Success stories and financial results from the use of EFT and/or TETT are provided as examples and are not intended as guarantees. Your results when participating in our sessions and programs may vary.